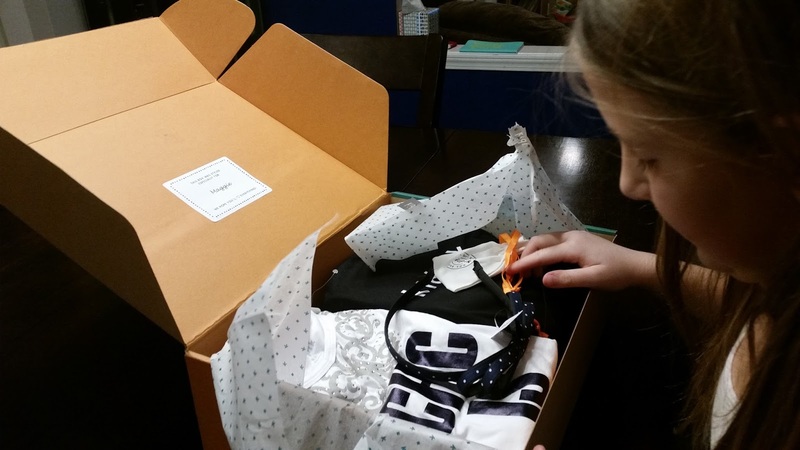 Maggie's fourth kidpik box might just be the best one yet! I hope our lucky streak continues, as I loved my last Stitch Fix box too! After hubby had a couple of busts with Bomb Fell, I've almost got him talked into trying one of Stitch Fix's boxes for men. Wish me luck! Maggie's first instant love from this kidpik box was the Christie Bootie Kids in grey. Their regular retail was $27.50. I'm sort of jealous, as I'd love a pair of booties like these for myself! Since she had them on almost before the box was all the way open, I think they ended up in every picture. In this first picture, she has the beloved boots with the Chic Necklace Tee (regular retail $16.50) and the Bow Knit Skirt in navy (regular retail $15.50), topped off with the Bow Dot headband in navy (regular retail $3.50). Admittedly, none of these was her favorite. Personally, I thought the 'Chic is Cool' phrase on the shirt was sort of odd for a young girl. She thought it was supposed to be 'chick.' At least it's long-sleeved for winter. The skirt is a little longer than most skirts she has, while not quite being a maxi. Now that I'm looking at it all again, I don't think she's worn either of these pieces again since getting them. But we did keep the whole box. This outfit was the favorite of Maggie and her dad and me. It's the Suede Hi Lo top in chili pepper (regular retail $16.50), with adorable Bouquet Floral Super Soft Skinny pants in navy (regular retail $19.50). Especially with the new booties, I can't say enough good things about this outfit. Not usually being very into current fashions myself, this looks exactly like a lot of the trendy outfits I'm seeing this season. I doubt I'd have picked out such fabulousness and paired it on my own. If you are another kidpik family, though, be a little careful with this shirt. Part of the reason we loved it was the super-soft feel. I think it's the exact same fabric as the holiday dress she kept from her last box. But it totally dyed her white camisole pink! They're both in the laundry now, so we'll see how it all turns out. I don't remember the dress staining anything, but the shirt sure did! She wore this outfit for our family's Thanksgiving celebration. Last but certainly not least was this lovely Floral A Line dress in navy (regular retail $19.50). It's super-cute, and I really liked the length. I think we'll try to find a thin white blouse that she can wear under this one for winter. And of course everything needs to match the booties. Overall, we liked the box! The items we wouldn't have kept without the discount ended up equaling less than the 30% discount for purchasing the whole box. So we kept it all! I also liked that instead of more iron/sew on appliques, the fun little goody bag included this time had textured stickers. Crafty things she can enjoy without my help are my favorite sometimes! I'm impressed that kidpik has nailed it every time for us. They've saved me major shopping trips for the last several seasons. Between her boxes, the hand-me-downs she regularly gets from a friend, and a few things I can pick up locally (without making a mall day trip), she's got a wardrobe she enjoys, and I've got less tasks on my list! She could wear a potato sack and look chic. Adorable! This is really adorable. Nice choices of outfit too!